So after a long wait, I've finally picked up my Miss Junko Swiss Roll Book 2 to work on another Swiss Roll. I term it the Ribbon Nutella Mango Swiss Roll. My previous attempt a real long time ago with the Pikachu design was kinda spongy for the design part. I wanted the entire cake to be as soft as possible. Of course, I wanted it to look really pretty. So I was bored enough from the warm weather (it's been insane of late here nowadays!) and since I had the evening free (rare moments), I decided to bake this very ribbon design that I've been eyeing. I choose Nutella and fresh mango cubes as they were just about the only stuff I have on hand right now. This is the Pikachu one I did probably a year or two ago. 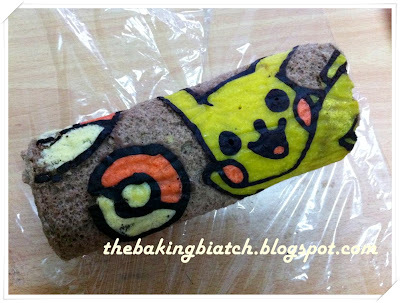 I should recreate it and make it real soft like what I did to the Ribbon Nutella Mango Swiss Roll. This Swiss Roll recipe is indeed really soft, softer than I had imagined. Of course, measures have to be taken to let it be that soft and to maintain its level of moisture. I've had experiences baking soft Swiss Rolls like those for the Yule Logs I did last Christmas, but truth be told, this recipe is even softer and it is a keeper for me. 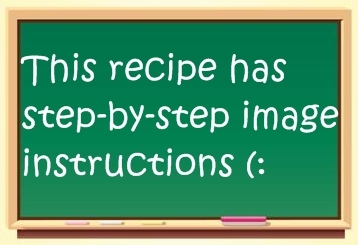 I termed this recipe as a difficulty level 4 as precision is required. Exact portions are required for each step to work so if you're afraid of a lil' precision and hard work for such a pretty swiss roll, I'd suggest you look else where. But trust me, the product is worth the hard work (: This recipe also requires your full attention as meringue is being used. Please do not work on the recipe halfway and attend to other matters, the meringue will deflate and turn watery with time. Then, the recipe will not be successful. Preheat oven to 170 degree Celsius. Trace the template using a pencil. Invert the baking paper and press to fit the tray. Remove paper, grease baking tin/tray and fit paper back nicely. Measure the oil and water. I dumped them together since they were going into the same bowl. Separate the egg yolks from the whites. To 3 of the egg yolks, add 35g of sugar. Whisk till light and well mixed. I used a spatula. Add the oil, water and vanilla bean paste/essence. I'd suggest Vanilla bean paste for a better taste. Mix well. BROWN MIXTURE: Scoop out 1 tsp of the mixture into a bowl. RED MIXTURE: Scoop out 2 tsp of the mixture into a bowl. Add the red food colouring to the RED MIXTURE bowl. Add the brown/black food colouring to the BLACK MIXTURE bowl. To the red mixture, add 1 tsp of corn flour. Have 1 egg white in a mixing bowl. Whisk using hand held mixer till' bubbles appear. Add 1 tsp of corn flour. Continue whisking till' stiff peaks form. The meringue should look like this. Portion 1/4 of it that is to be added to the RED MIXTURE. Add 2 tbsp of the remaining meringue to the brown/black mixture. Fold in meringue. Your mixture will look something like this. Place the mixture into a piping bag. Snip a really small hole big enough to draw a fine line. Pipe the outline of the design. Bake for EXACTLY 1 minute. Add the portioned 1/4 of meringue into the red mixture. Fold in. Pipe design to fill gaps. To the remaining 3 egg whites, whisk till' bubbles appear. Add the remaining sugar (30g). Whisk for 5 seconds. Add the remaining meringue from the drawing of design into the bowl. Mix for 5 seconds. Add 1 tsp of corn flour. Mix well till stiff peaks are formed. Introduce 1/3 of the meringue into the egg yolk batter. Fold in. Add the remaining meringue and fold in. I used my hand, as usual. Pour mixture into baking tin/tray. Spread out evenly using a spatula. Bake for 14 minutes. My soft spongy swiss roll! Place a cake board on the top of the baking tin. Invert baking tin. Remove baking tin. Peel off baking paper. Beautiful design! Cover with a fresh sheet of baking paper and leave to cool completely. In the mean time, whisk up the whipping cream till stiff peaks are formed. I prefer non-dairy whipping cream as I'm lactose intolerant. But if you prefer the taste of dairy whipping cream, feel free to replace it. Add in the Nutella. YUM! When cake is completely cooled, invert and remove cake board. The top skin of the cake should stick to the cake board, just like intended. If yours do not stick, peel off by hand or use a knife to trim it. This layer usually makes the cake dry. Apply the Nutella cream onto the swiss roll. Using the baking paper that's clean/cling wrap, wrap the swiss roll. Ensure that the swiss roll does not come into contact with air as much as possible. Chill for 30 minutes to allow swiss roll to set. Remove from fridge and slice off a couple cm on the sides to get a uniformed non-messy look at the side. Serve chilled. Do store the cake in an air-tight container when not being consumed. I hope you'll enjoy this Ribbon Nutella Mango Swiss Roll! Wau, pretty design. Will bookmark your recipe. Thanks for sharing! thank you! (: Do have fun baking it! email me if you need the template! so beautiful. I love it.. I would love the template pls. I 'm going to email u.. Btw, do you have ANGRY BIRD template? I've been trying to make one, but couldn't do it..lol.. I don't know how to adjust to bring it on the top of the cake... If you've ever tried, pls share with me. thanks for showing steps. thanks my dear. I got this template.